Talis searched the swamplands in twilight, driven by the challenge of hunting his first boar. He bent down and ran his fingers along the mud. Boar tracks, leading towards a stream. Fresh, maybe a few hours old. He looked ahead, squinting at the path illuminated by the four moon sisters. Mara, his best friend, came alongside and studied the tracks. He pointed his spear to where they led. Talis and Mara hunting a boar. A blur of movement ahead shifted his attention. He stopped and searched. There, beyond a patch of bushes, something waddled down a muddy path. His heart pounded at the sight. Tensing his muscles, he stalked low, tracking the animal. He touched the track, and grinned at Mara. A boar. He followed until he reached a stream, and there, in a wallow surrounded by a circle of mossy rocks, was a boar, settling into the mud. This boar will make a fine roast for Mother’s kitchen, he thought, wielding his bow. He nocked an arrow and glanced at Mara. She nodded, her eyes wary, but she readied her bow as well. This will be a tricky shot. 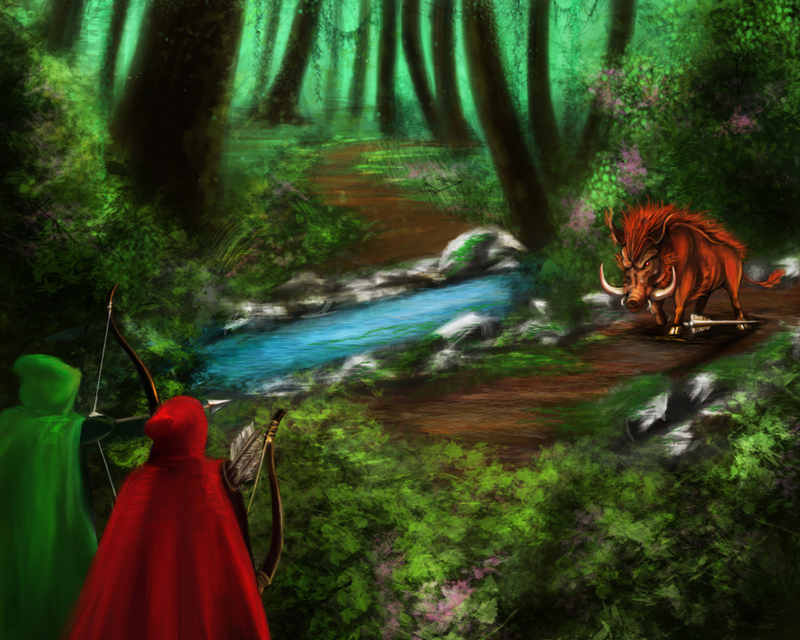 He leaned to the side, aimed, and the arrow sped towards the boar. It was a good shot. Straight at the target, but the arrow caught a thicket's branch and droned off past the boar. The boar jerked its head up and glared at Talis. He barely had a second to think before the beast sloshed in the stream, bounding towards him. 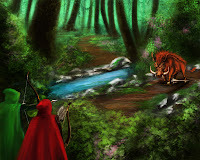 He ducked as Mara’s arrow flew past him and slammed into the boar's chest. He brandished his spear. “Spread out,” he hissed, and circled around as Mara gripped her spear. He twirled his weapon, ready to strike. The boar charged. He leapt out of the way, and thrust down as it whipped its tusks at his leg. The creature squealed in pain as his spear pierced the back of its neck. Mara dove at the boar and sliced its rear flank. It screamed, swung its tusks around, and knocked her to the ground. The boar bounded away, howling and grunting in a mad rush. Mara winced and hunched over. “Are you alright?” Talis bent down next to her. After she coughed, redness swept over her face. “It knocked my breath out…there are stars everywhere!” She coughed, getting to her feet with the help of Talis. But she stumbled and almost fell. He crinkled his forehead, unconvinced she was okay. She wobbled, then slapped her palms to her stomach. Talis grabbed her just as she was about to topple to her knees. Mara shook him off, trying to steady herself. She winced and wiped her hand across her mouth. A line of blood sat menacingly on her wrist. She stared at her hand. Talis grabbed her arm and slung her over his back. “I’m taking you home now.” He carried her, stumbling down the bluff, ignoring her protests. A wound that caused bleeding from the mouth was very serious. After awhile he was too tired to carry her, so he rested for a bit. Even though it was almost dark, Talis could see that Mara looked paler. He had to get her home quickly to a healer. By the time they spotted the city from afar, moonlight sent long, wiry shadows across the hillside leading up to the towering stone walls. Lights flickered from countless braziers mounted hundreds of feet higher on the upper part of the city. Naru stood ominous under the garish light of the four moon sisters. The evening gong sounded from atop a watchtower. 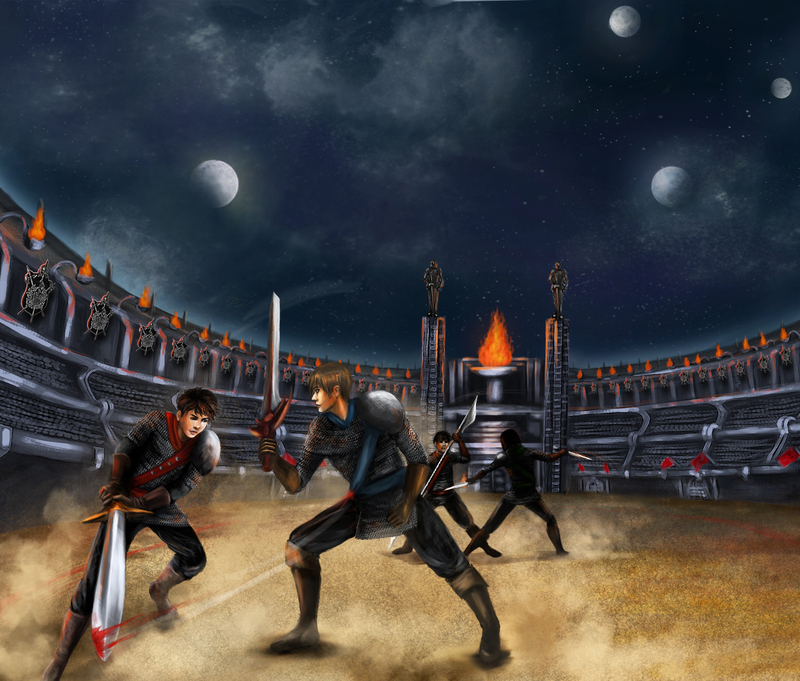 As Talis and Mara approached the main gates, a group of soldiers making their rounds studied them. “Carem and Jorem! Help carry young Mara,” Baratis shouted. 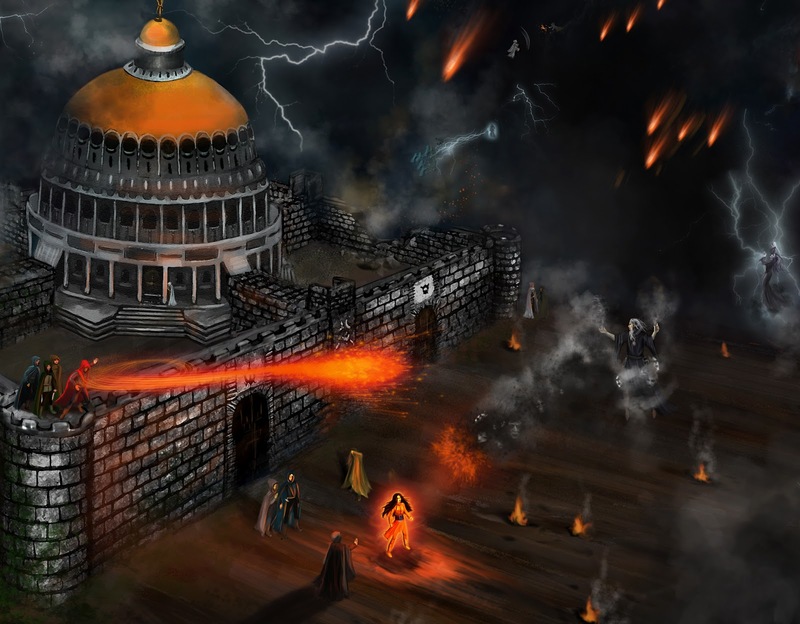 The soldiers carried Mara through the gate, massive steel shafts rising into the stone walls. Eyes blinked at them from behind murder holes as they entered. Archers ready to strike down enemies in a siege. Spread before them past the gate was the Arena of the Sej Elders, formed of gigantic white granite blocks, rising over everything in the lower part of the city. Stone towers lined the wide avenue leading up to the arena. The soldiers’ boots clapped against the cobblestone streets as they strode past the arena, finally winding around until they reached the gates of the upper city. Up the snaking rise, they walked past merchant shops and eyes that gawked at the soldiers carrying Mara. They continued on, to the highest part of the city, beneath the Temple of the Goddess Nestria, the Goddess of the Sky. To Mara’s house, the House of Viceroy Lei and Lady Malvia, daughter of the king and second in line to the throne. As the soldiers carried Mara towards the white marble mansion, Talis worried that her wounds were too grave to cure. Today was the worst day, and he was all to blame. Why did he have to chase after the boar? Two servants ran up and gasped when they noticed Mara, and they quickly carried her inside. Lady Malvia rushed towards them, her silver robe swirling behind her. A sick feeling wrenched his stomach as he raced out back to a small building overlooking the rose garden. It was his fault. He never should have insisted on going hunting in the first place. He vowed not to go on the hunt again—not if it meant hurting Mara. Inside the healer’s apothecary, he found Belesia grinding herbs inside a round, wooden bowl. The room held the pungent smells of mold, fire and smoke. The walls were lined with jars of herbs, roots, dried insects and small, shriveled animals floating in clear liquid. The healer narrowed her eyes at him. Inside Mara’s room, she lay on her bed, a servant swabbing a wet cloth on her forehead. Belesia rushed to the girl’s side and pressed her palms over Mara’s forehead and stomach. “The wound is deep…the flow of energy blocked. The fever, rising.” Belesia chanted words from a strange tongue, from the western islands, lands filled with the magic of the earth and the spirits. Her eyes narrowed to small slits, and the room dimmed as her chants grew louder. In the darkness, the healer’s hands glowed, red like burning embers, and Mara was filled with light, as if her veins pulsed with iridescent gold. Mara’s eyes flung open, unseeing, as if she stared at something that only existed far away in her mind. Talis stepped forward to hold her hand but Belesia motioned him back. “Will she be alright?” Talis whispered, his voice choked and sad. “I will…I promise. 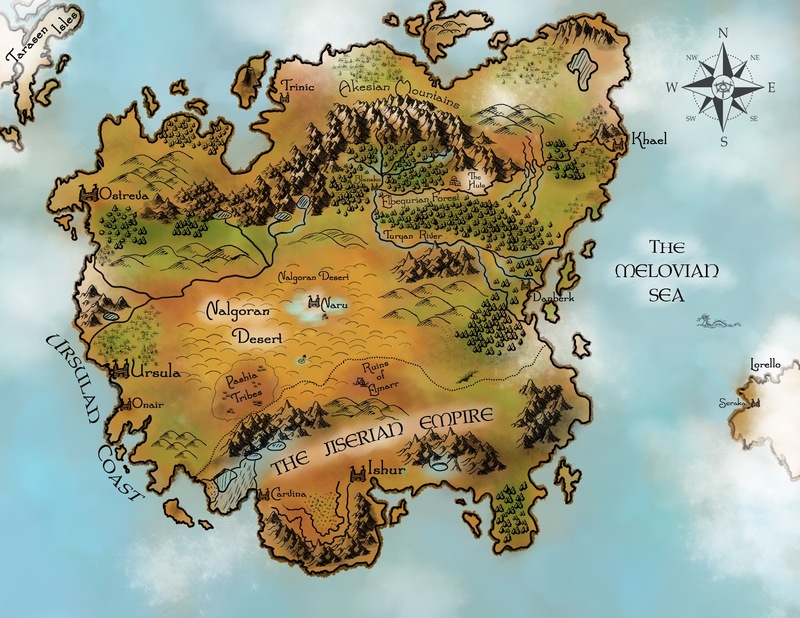 I’ll do anything—gods willing—to keep Mara alive.” Talis bowed his head and pinched his eyes shut, saying the words of prayer to Tolexia… God of Healing, God of Harmony, listen to this mortal’s plea for Mara. Fair Tolexia hear my prayer and save her life, from my heart pure and my mind full of gratitude. When Talis opened his eyes, Lady Malvia stared at him with a mixture of curiosity and fury. Talis trembled at her glare and found himself retreating from the room. “I want you out of this house,” Lady Malvia said. “If she lives you’ll save your family from shame and bloodshed. For only blood will satisfy blood. And the gods may ask for your blood if Mara dies. She motioned for a servant with her eyes, and the man led Talis out of the mansion. Please let Mara live, please, Tolexia, please. Talis kept seeing Mara’s shining face, laughing and teasing him. She was his best friend. He’d ruined everything today by his foolishness, and put Mara’s life in danger. Her life was worth more to him than all the hunts in the world. He stumbled down the cobblestone street, bumping into trees and people, barely able to see straight with the tears blurring his vision. It was only just a short ways to his house, the House of Garen Storm, but he almost went the wrong way. Somehow he reached his mansion and a servant ran inside to alert his parents. He lowered his shoulders and sighed. How could he face father now, after all that had happened today? She would live, the gods were good, she would live. Talis felt it burning in his heart. Father came limping down the dark hallway, carrying his hawk-headed cane as if it was a weapon. He swept aside his black silk cape, black eyes glaring, puffing on a pipe, sending smoke swirls rising into the gloomy air. The candlelight from the servant standing on the side of the room sent flickering black gashes across father’s face. “Yes, Master Storm.” Haldish bowed, and set the candle on an long wooden table containing carved statues of the gods. “We were out hunting…Mara was hurt by a boar.” Talis tried to catch his eyes, but father just sighed and shook his head, then started hobbling towards the fire at the hearth in the great room. Talis felt himself shrink back at Father’s words. He noticed his mother leaning against a marble column, staring sadly at him. Talis nodded and she waved back. Garen glanced at his wife. “All that I’m saying is…be cautious, be more like your older brother…” His voice faltered and broke, and his eyes reddened suddenly. He raised his clenched fists towards the sky, face puffed and fuming. “Why, Nyx? Why did you have to take Xhan away from me?” He pushed himself to his feet, turned and tromped off, retreating once again into his study, the place where he often locked himself away from the family, in the years after Talis’s older brother Xhan had been poisoned from a fight with desert marauders. Mother crept forward and put her arms around Talis. She hugged him for a time, and Talis could feel the worry and blame melt away from his mind. “Why was I so stupid.” His voice cracked and he placed his hands over his head. He felt somehow that he was to blame for the way Father acted since Xhan’s death. Maybe Father was right, if he was more careful, Mara would never have been injured by the boar. His mother sat next to him and he told her what had happened in the swamplands. Lia squeezed his hand. “Mara will be alright…I just know it.” His sister was so delicate and feminine, and her eyes held certainty and innocence, with a wisdom beyond her seven years. She nodded, her face beaming, and she glanced concerned eyes at Talis. “Can you eat something? Or perhaps some soup,” his mother said. 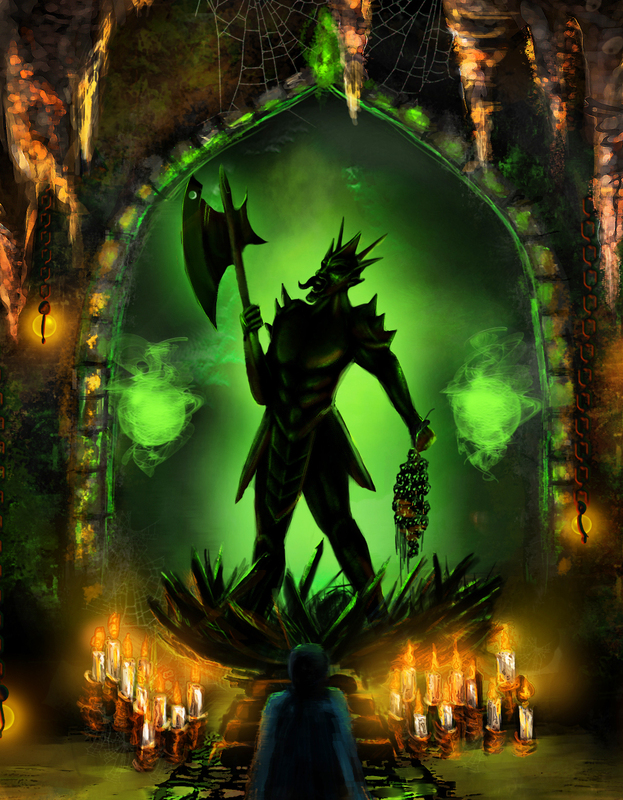 He bowed his head, and once again prayed to Tolexia for Mara to return to health. He turned and shambled outside and up the stairs to his bedroom loft. Before going inside, he gripped the rail and stared out over the city of Naru, lit with the pale light of the four moon sisters. Thoughts of Mara and Lady Malvia and Father raced through his mind. And Xhan…his older brother, he couldn’t even picture his face anymore. Did the power of death do that to memories? If Mara died, would he forget her face as well? After several days of worrying about Mara’s condition, with no reports from Father or Mother, and Lady Malvia’s refusal to allow his access, Talis thought of a way to find out how she was doing. That afternoon, he slunk behind a tree near the side door of Mara’s mansion, waiting for the healer, Belesia. She usually ran errands in town around this time, and around twilight, the wooden door creaked open, and Belesia stepped out onto the cobblestone street. She wrapped her shawl over her shoulders and strode away. Talis followed her from a distance, past the royal mansions, past the merchant’s houses, past the upper markets and their sweet smells of bread and cakes and ale, until they reached the dingy lower part of the city. All Talis could think about along the way was whether Mara was all right. Would Belesia be under orders forbidding her to tell him anything? But he couldn’t believe that, the healer always did what she wanted, valuing the gods and friendship more than anything else. She was a friend, wasn’t she? When they entered Fiskar’s market, Belesia stopped at a stall where a man with a twenty-pound tumor in his neck sold mushrooms. Belesia haggled with the man for a bit, clucking disapprovingly at the price, then finally handed him a few coins and clutched the bag under her arm and left. “I tried to respect the wishes of House Lei.” He didn’t want to get in more trouble than he already was. She turned and sauntered away, her words still lingering in his heart, and Talis pictured Father after news of Xhan’s death had reached him. He had suffered and Talis realized he hadn’t been there to comfort Father when he needed it. Maybe there was more he could do. A laughing couple tramped by, the girl bumping into Talis. She bowed her head in apology and giggled as they strode off. Talis glanced around at the merchant stalls, thinking of Mara again, and decided he should find a gift for her. The air in Fiskar’s Market smelled of roasted venison, pork, chicken, and sweet pies from the baker’s oven. He sauntered around, scanning the vendors hawking their goods: sacred charms, shrunken heads, colorful jewelry studded with precious stones, Orbs of the Sun and Eyes of Death, and prayer beads sold by gold-toothed monks. Fiskar was long dead, but the name stuck. He was smart enough to set up business and sell in front of Shade’s Gate and next to the Temple of Nyx, the God of War. Talis discovered a merchant who claimed to have recently purchased amber feathers with white flecks, plucked from a rare bird found along the Southern coast of Galhedrin. Mara was crazy about collecting feathers and would adorn her hunting hats with them. So he bought a particularly beautiful feather for her using money saved from pelts he’d sold from hunting in the swamplands. Out of the corner of his eye he spotted Nikulo, a boy he knew from the Order of the Dawn, where they both studied magic. Nikulo studied the healing arts, and Talis studied elemental magic, although his success was limited to magic done in training dreams. He’d never managed to produce magic like the other apprentices and felt very frustrated at his many failed attempts. Nikulo was off in the back corner of the market buying something from a merchant Talis was sure sold poison and other black arts supplies. As if afraid he’d be seen, Nikulo glanced around several times, and marched down near the stall where Talis stood. Talis tried to hide behind a bunch of feathers, but Nikulo stopped, and glared at him. 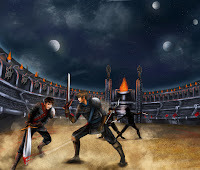 The Blood Dagger competition. Talis thought of the sparring competition held once a year, and froze, realizing he’d forgotten all about it. Wasn’t it only a few days away? With Mara injured, they’d moved the date, but Talis knew that House Lei and House Storm would never allow Talis and Mara to forfeit to the likes of Nikulo and Rikar, his sparring partner. Claiming rights to holding the Blood Dagger for a year meant far too much to the royal houses, especially since their Royal Houses had lost claim to the victor’s rights over the last few years. Nikulo’s coffee-brown eyes sparkled as if he was eager to tell a new joke. He waddled close to Talis, holding a porcelain jar in one hand, and he yanked up silk pants that kept falling below his protruding belly. 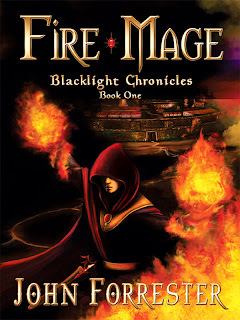 He scratched his curly hair and released a smoky fart, blowing the fumes in Talis’s direction. Talis coughed, retreating quickly. Nikulo never should have swallowed that last potion he concocted. All his farts smelled like sulfur and mustard and spoiled onions. “Oh this?” Nikulo glanced around at the jar he was holding. “Just ingredients.” He fidgeted, constantly glancing towards Shade’s Gate, the way to the upper part of the city where Nikulo lived. The next morning Talis awoke to spindly shadows dancing across his blanket as the wind knocked the shutters back and forth. He hated waking this way. His cat, the yellow and white Tobias, pounced on his bed, tail jerking crazily, staring above at the amber feather flipping in the breeze. Talis had mounted the feather on a strand of leather tied to a wood beam that spanned across the ceiling. But the cat leapt anyways, trying to swat the feather, but missed it by a few inches. The shutters slammed suddenly opened and Talis spun around. Mara was perched on the windowsill, grinning viciously at him. “Miss me?” She jumped inside and dove into his bed, wriggling under the covers. Her hands were uncomfortably near his pants. Tobias immediately pounced on the bed, leaping high into the air every time Mara moved. The cat meowed, a complaining meow, and Tobias stared, as if trying to figure out what was going on. “You’re all better!” Talis sighed, relieved to see her healthy and so active. “Way to state the obvious. No”—she coughed and clenched her stomach, falling back to the bed—“I’m about to keel over and die.” She laughed maniacally and pulled the blanket over her head. Talis nodded, then jumped up to grab the feather. He smiled, and braced himself as she flung herself onto him, giving him an enormous suffocating hug. From the look on her face, it was worth every silver piece getting her the feather. “Well, if you want to know, I’m craving dumpling soup from Fiskar’s Market. Hurry up, already.” She pulled her cloak over her head and jumped out the window.